Today I want to share this super flashy look I did using Nail Art Society's "The Great Glitzy (Silver)" set. For those of you who may not be familiar with Nail Art Society, they are a monthly subscription box. Every month they provide you with a "curated" kit for a themed nail art look. It also looks like you can shop the sets individually without having to sign up for the monthly subscription. It is such a neat concept. There is such a wide range of kits for all different styles. The set featured here is "The Great Glitzy" in Silver, also comes in gold. This set is all about flash, bling, sparkle and extravagance. The featured polish is by Floss Gloss Dimepiece (lololol). The kit also includes a baggie of gems and other apliques, as well as a small jar of huge Silver prismatic loose glitter. For this look I chose to play with the gems instead of the hexes. I started with a sheer pink base using O.P.I Be Magentale because I wanted to do an exaggerated sparkling "french gradient". And also because my nails are hella stained and naked just would not have looked good. Using a piece of cosmetic wedge I dabbed on Floss Gloss Dimepiece just on the tips of my nails. This polish is SOOO sparkly and pretty and DENSE, it is a great thing. The particles are all holographic and on the smaller side, it twinkles a lot. I worked on each nail individually since I was suing nail glue to apply the stones. There was absolutely no rhyme or reason behind the application of the decorations. I wanted it to look like I covered my nails in glue and dipped them in a vat of sparkling stuff. I think I definitely achieved my goal. I used O.P.I nail glue to keep the stones on my nails. I top coated with KBShimmer Clearly on Top. I am happy to report that I wore these for about Four days and didn't lose a single stone. The Great Glitzy set is available from Nail Art Society for $11.95. It also comes in a Golden version, which is equally awesome. I am in LOOOVE with Floss Gloss polishes and their hipster vibe ;D. The bottles are just adorable. Speaking of hipster... This is what I've been up to lately... When I am happy, sad, tired, sore... I spin. I needed something physical to channel some energy to and hooping became that thing. As you guys know I struggled with my health for a long time... Now things are so much better so I have to work on getting my body back in shape again. Hooping is the best physical activity I've ever picked up. It is so much fun :D.
The hooping actually looks like so much fun, and you're doing all this stuff around it!!! How did you get to know it ?? These are gorgeous! Love all the bling and sparkle. Ah thank you for this!! I am looking for a Secret Santa type gift for someone whom I have never met but said they liked "Sparkly polish". This is perfect!!! Your swatches are amazing as always. 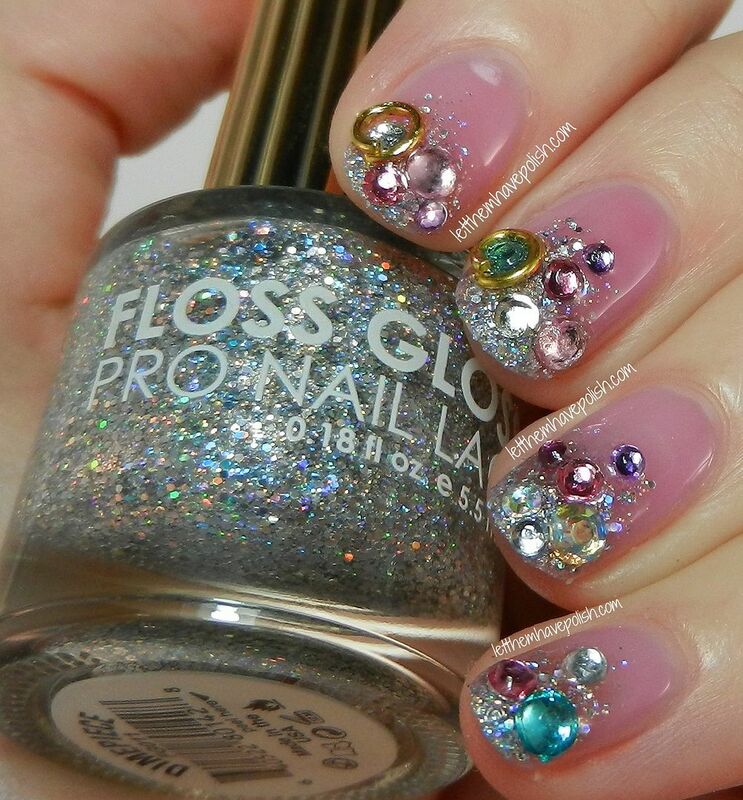 What a beautiful and sparkly mani! It's gorgeous! Amaziiiing, love the combination between the pink base and the silver sparklesss <3 <3 !! I wanted to see a lot more of the hooping. I jumped over to youtube to see your other two hooping videos. Thought it was great that your skirt in this video and the tights in the previous video looked like manis you would do. That skirt would be a great mani in particular. What a great, consistent, artistic viewpoint! Love this mani. Must try. :) I read on your blog a few months ago that you were moving to California. I live in Sacramento. I hope you're loving your new home state? Pink Wednesday! Happy 10th Mean Girls!!! !